the stock is similar to that in Mystery 53, so could perhaps be supplementary to that. it is probably the photograph mentioned by John Alsop. why was such a long train necessary on the Leicester-Nuneaton line? I can confirm that this is the picture that I referred to. The stock is ex-North London. No idea as to reason for length of these trains. These old North London Rly trains were made up of close coupled vehicles in fixed formations of 10 vehicles. Around 1920-21 twelve NLR sets were used for workmen's trains in the Leicester/Nuneaton/Coventry area. They are shown on a drawing dated January 5th 1920 as C.F. nos. 2-11, and N. nos. 11 and 22, "Working on the Leicester Branch". The meaning of C.F. and N. is obscure. By December 3rd 1920 the seconds had been downgraded to thirds and the firsts to composites (2F + 2T), and eight of the trains were now entitled Leicester and Leamington Sets nos. 15 - 22. The remaining four sets were dispersed elsewhere. They were also renumbered into the appropriate LNWR series and some - perhaps all - were repainted into LNWR "Choc and white" (sic) livery. At this time long buffers were fitted between the fifth and sixth carriages so that the sets could be split into 5+5 (see Mystery Photo no.53). So this photo dates from 1920 and shows a ten-coach train which at that date could not be split. It is unclear how long they remained in service in the Leicester area. At least four of these trains survived to receive LMS numbers (and presumably LMS crimson lake livery) in 1924-7, but had been withdrawn by 1933. It is odd that these old coaches (apart from the brake vans) were given LNWR numbers in the capital stock (without any 0 prefix), and were still in capital stock at the grouping. A typical train: C.F. No.8. 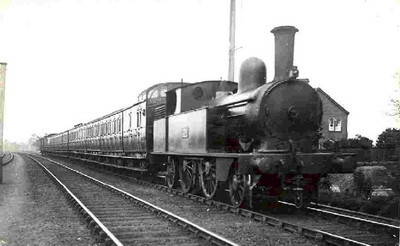 (Later Leicester and Leamington no.18). Renumbered to LMS 10/07/25. The ex-NLR sets marked "C.F." were Chalk Farm Sets 2-11. These are shown in the 1919 Local Carriage Diagram Book as 10 trains of 10=10 carriages, working local services between Walsall, Leamington and Nuneaton. (That is, there were 10 trains of 10 non-bogie carriages each (10=10). Had they been bogie vehicles it would have been 10=15. This notation is precisely as per the LNWR Carriage Diagram Books). The identification of 'CF' is most interesting. Do the letters 'KH' or 'HK' have a similar meaning? I ask because many years ago, clambering round grounded bodies on an allotment in Wolverton (with permission! ), we came across a single compartment of an LNWR arc-roofed compartment carriage from the Park era. It was in a rough state, but on the top of the roof, a couple of inches in from the end of the carriage, were screwed these cast iron letters about 2in tall. I can't find my notes just now to check whether it was 'HK' or 'KH'. They were fixed so as to be readable from the end of the carriage, standing on the end steps. They would not have been added after being grounded, so must have had a railway significance of some sort? If not to signify a location or set train, then maybe of some significance to somebody walking along the roof - for example a type of lamp?